Western blot analysis of extracts from various cell lines using ATF-2/ATF-7 (A9G1M) Rabbit mAb (upper) or β-Actin (D8A6) Rabbit mAb #8457 (lower). KARPAS cell line source: Dr. Abraham Karpas at the University of Cambridge. 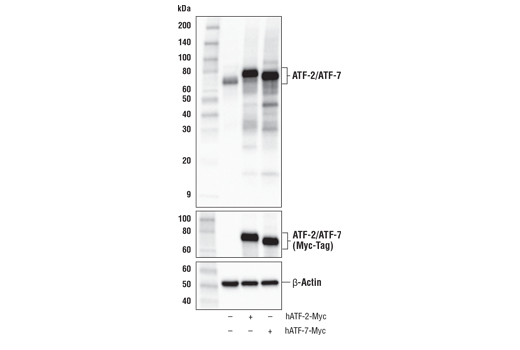 Western blot analysis of extracts from HeLa cells, mock transfected (-) or transfected with a construct expressing Myc-tagged full-length human ATF-2 protein (hATF-2-Myc; +) or a construct expressing Myc-tagged full-length human ATF-7 protein (hATF-7-Myc; +), using ATF-2/ATF-7 (A9G1M) Rabbit mAb (upper), Myc-Tag (71D10) Rabbit mAb #2278 (middle), and β-Actin (D6A8) Rabbit mAb #8457 (lower). 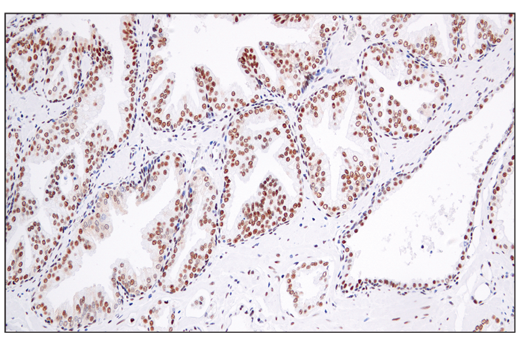 Immunohistochemical analysis of paraffin-embedded human colon carcinoma using ATF-2/ATF-7 (A9G1M) Rabbit mAb. 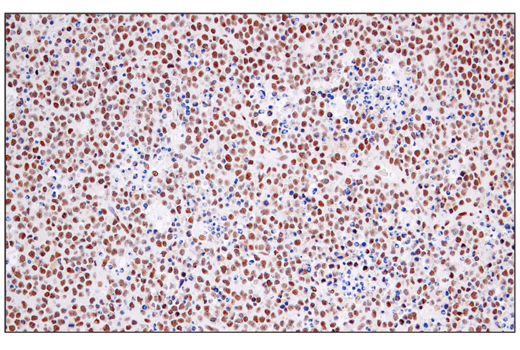 Immunohistochemical analysis of paraffin-embedded human non-Hodgkin's lymphoma using ATF-2/ATF-7 (A9G1M) Rabbit mAb. 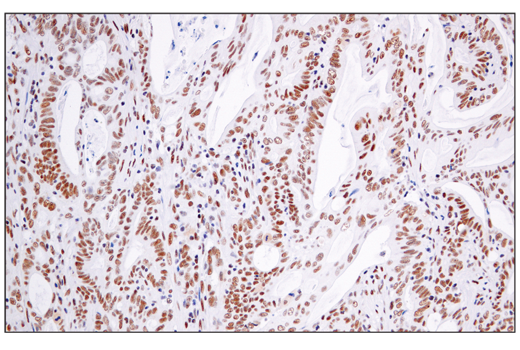 Immunohistochemical analysis of paraffin-embedded human endometrioid adenocarcinoma using ATF-2/ATF-7 (A9G1M) Rabbit mAb. 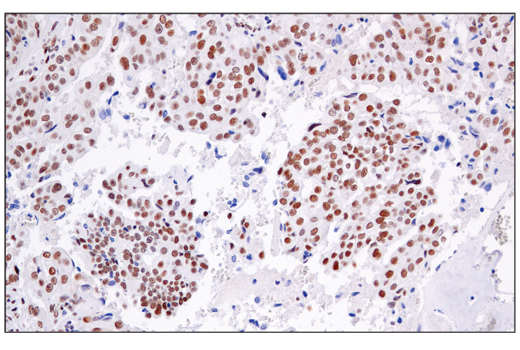 Immunohistochemical analysis of paraffin-embedded human prostate carcinoma using ATF-2/ATF-7 (A9G1M) Rabbit mAb. 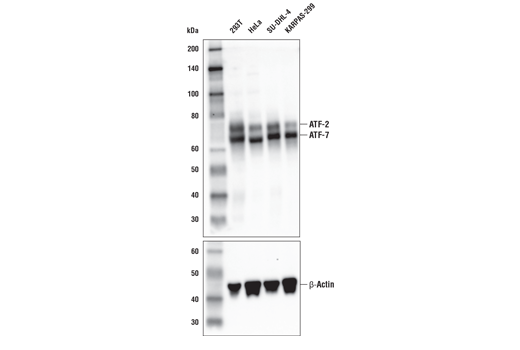 ATF-2/ATF-7 (A9G1M) Rabbit mAb recognizes endogenous levels of total ATF-2 and ATF-7 proteins. Monoclonal antibody is produced by immunizing animals with recombinant protein specific to the amino terminus of human ATF-2 protein.